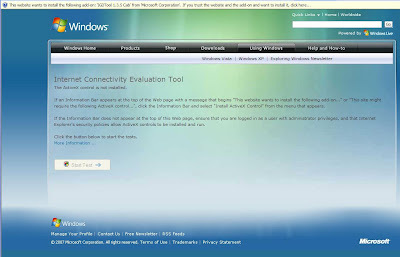 Microsoft is offering an Internet Connectivity Evaluation Tool to evaluate a user's Internet connection, or the router that is used to connect to the Internet for Vista compatibility. Why do I get a kick out of it? Because, our company, like other VARs or Integrated Solution Providers are on the hook when the software breaks! We are the ones directly responsible for our client's business well being. Remember, we deal with small to medium businesses that can be wiped out by a full technology failure. Our own clients are protected, as we have worked very hard on DRP related "insurance" for their company. But, there are a lot of companies out there that do not have any sort of real backup and DRP in place. The machine this test is running on is an XP Pro SP2 box. The XP Pro SP2 box is running behind SBS 2K3 Premium R2 with ISA 2004 SP2 installed and configured. ISA has all current patches and the SBS box has been RipCurled. W2K3 SP2 is not installed at this time. 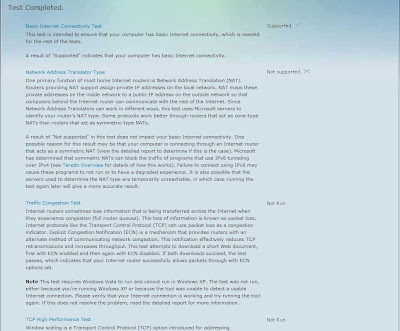 The NAT portion of the test failed and cascaded to the other portions of the test except for the Multiple Simultaneous States Test which ISA passes with no problems. In reading the results information below the initial failed test, I can see the references pertaining to IPv6 being relevant as we do not have IPv6 installed and configured on the SBS/ISA box at this time. As far as we can see with our production SBS/Vista implementations, Vista is functioning 100% with few complications. UPDATE 07-04-16: The D-Link DI-624 Rev. C (Firmware 2.53) passed tests available to XP with the exception of the UPnP feature. I am updating the firmware to see if the test is successful after that. I will hook up a Vista box to the unit to test again when I have a bit more time.